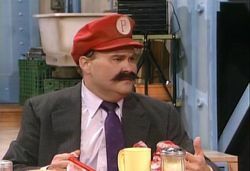 Pietro is a con artist and human who possibly lives in Brooklyn, New York in The Super Mario Bros. Super Show! In The Super Mario Bros. Super Show! episode "Fake Bro", Pietro appears in Mario Brothers Plumbing one day and meets Mario and Luigi at Mario Brothers Plumbing; upon being asked by Mario and Luigi who he is, Pietro responds that he is someone from the past and proceeds to ask Mario and Luigi if they remember him. After getting no as a response from Mario and Luigi, Pietro proceeds to tell them that he is family and is Mario and Luigi's long-lost brother who no one ever mentioned due to the fact that Pietro's very name would bring grief to Mama Mario. After telling Mario and Luigi all this, Pietro promptly gives them a large, somewhat awkward hug. Later, after Pietro had made his dramatic introduction to Mario and Luigi, he, along with Mario and Luigi, sit down to a lunch of pizza with him. As they eat pizza, Mario and Luigi begin to ask Pietro why Mama Mario never mentioned him; Pietro responds to Mario and Luigi's question by saying that Mama Mario was ashamed of him and also goes on to say that, at an age where Mario and Luigi were to young to remember him, Pietro ran away from home and traveled the world. After telling this story, Pietro begins to cry, saying that, after all his travels, he decided to return to his family and the business, which Pietro says he wishes to take over. Though Mario is more than happy to accept Pietro as his brother, Luigi is suspicious of him and begins to question Pietro, asking him several personal questions, all of which Pietro answers correctly. After Luigi's bombardment of questions, Pietro says that he would have to be family to know the answers to all those questions and goes on to say that he wishes to sell Mario Brothers Plumbing in order to spend more time with Mario and Luigi. Later, as Luigi, still unsure about Pietro, decides to call Mama Mario, Mario talks with Pietro, who is inspecting Mario Brothers Plumbing. Finishing his inspection, Pietro tells Mario that the fixtures of the apartment can be sold tomorrow and the rest of the place can be sold in a week, with Pietro getting seventy percent of the profits and Mario and Luigi getting only thirty percent. After Pietro tells Mario this, who, after some doubt, is tricked into believing the deal is fair, he overhears Luigi talking on the telephone. As Luigi talks on the telephone, Pietro and Mario listen to Luigi state the Mario Brothers Plumbing owes $900,000 in back taxes to the IRS, to which Luigi replies he will ensure prompt payment. Luigi hangs up and says that since they are all in the business, each brother is responsible for $300,000. After hearing that he has to pay a third of this staggering bill, Pietro quickly tries to leave Mario Brothers Plumbing, only to be stopped by Mario, who asks where Pietro is going in this family crisis. Throwing his "P" emblazoned hat aside, Pietro exclaims that he wasn't Mario and Luigi's long-lost brother, he was someone who had simply researched them and had planned to trick them into selling their business, with him getting the bulk of the money in the sale. After revealing his secret to a stunned Mario, Pietro quickly flees from the apartment. This page was last edited on February 7, 2019, at 00:54.